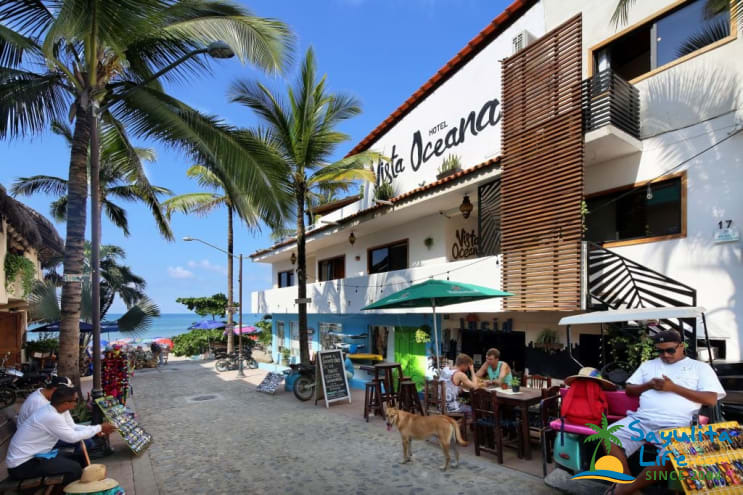 Hotel Vista Oceana in the heart of Sayulita, on one of the most colorful beaches right next to the Pacific ocean. Famous for its easy going staff and a vacation you will never forget. We offer beachfront living right in the center of Sayulita's main beach with exquisite ocean views from our huge common rooftop terrace, and exceptional service. Hotel Vista Oceana is eco friendly, with solar heated and UV purified water. Our modern and comfortable rooms are light, airy, and perfect for your Sayulita vacation. All rooms have a safe, A/C, shower and toilet, towels, USB plugs and High Speed Wi-Fi. Room types listed below. Room rates vary. Please select the Pricing tab above to view individual room rates. #1 Queen: Economy room, has a queen bed and sleeps 2. #2 Ocean View Queen: This room has a queen bed and sleeps 2, with an Ocean View. #3 Modern Bunk Room: This room has a bunk bed made up of a double and single and sleeps up to 3. #4 Ocean View Queen: This room has a queen bed and sleeps 2, with an Ocean View. #5 Ocean View Queen: This room has a queen bed and sleeps 2, with an Ocean View. #6 Modern Bunk Room: This room has a bunk bed made up of a double and single and sleeps up to 3. #7 Balcony King with Daybed: This room has a king and single bed and sleeps 3. It has a gorgeous view of the ocean and boardwalk from the private balcony. #8 Balcony Queen: This room has a queen bed and sleeps 2. It has a gorgeous view of the ocean and boardwalk from the private balcony. #9 Penthouse King with Daybed: This room has a king and single bed and sleeps 3. It has a massive bathroom/shower, flatscreen TV, bar fridge and gorgeous view of the ocean and street from the huge second-floor terrace. Please use the contact form to get in touch by email or phone with any questions and to request a reservation. We look forward to welcoming you to Hotel Vista Oceana in Sayulita! Hotel Vista Oceana is right on the beach, 2 blocks from the plaza. What a fabulous location. From the roof-top terrace, you can watch the activity on the beach and hear the waves. The sunset from the terrace could not have been better. A great place to read and relax. The rooms are clean and neat. Exactly what you need when you are spending most of your days outside. This is a top notch hotel. Perfect location, beautiful room, helpful personnel. We had the best stay at Hotel Vista Oceano! Such a fun, central location, within walking distance to everything. The penthouse room was beautifully decorated and the patio so relaxing with great views (and people watching!). Personnel were friendly and very helpful. Hope to return (soon). It did get noisy some nights, due to nearby bars and music, but this provided even more memories,and didn’t interfere with sleep due to earplugs. I celebrated my 40th birthday on the terrace of Vista Oceana and the location, terrace, room and staff made the experience extra special. The location is perfect for having a tranquil home base close to the action - beach, shops, restaurants. Rooms are clean and stylish with cold AC, wifi, and TV with netflix, amazon. The terrace has amazing views of the beach where you can enjoy coffee in the morning and drinks for sunset. The hotel and terrace is perfect for wedding guests to come and enjoy. Modern, clean and comfortable, in the BEST location! This is a place to be able to relax, excellent service, small but comfortable rooms, great to be able to take a while and watch the sunset and enjoy it, highly recommended the terrace, safe location, liked it and hope you have a pleasurable experience like mine. Este es un lugar para poderse relajar, excelente atención, habitaciones pequeñas pero muy confortables, terraza genial para poderse tomarse un rato y ver el atardecer y disfrutarlo, muy recomendable,seguro les gustara y tendrán una experiencia tan agradable como la mía. Realmente este hotel lo tiene todo. Excelente ubicación, habitaciones acogedoras y una zona común con una vista inigualable. Vista Oceana is a beautiful boutique hotel on the beach in the heart of Sayulita. Close to everywhere you'd want to go, super comfortable & clean with a gorgeous rooftop patio area. Would totally recommend staying here & definitely would stay here again :) Thank you Sandra, Rachel & Jen for making our stay the best! La mejor en Sayulita - The best in Sayulita! Dave liked Sayulita so much, he bought a hotel.